Here is another anthro animated feature for 2012. The 80 minute Ernest et Célestine, based on the French childrens’ book by Gabrielle Vincent, is due for a December 12 release in France. There does not seem to be a trailer yet, but here is a short making-of clip, and Cartoon Brew has a few previews. Another surprising lack of comments. Also, Fred as in Fred Patten? Well, I'm looking forward to it, whenever the DVD release comes around! :) It looks charming, though it's probably aimed at a very young audience. Plus some of the animators are the same people who worked on A Town Called Panic, so I hope it goes well! And yes, Fred here = Fred Patten. I haven't seen soft line work like that since many of the pre-60's Disney feature cartoons. This I would put on my list. 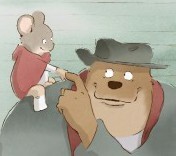 Jerry Beck, on the Animation Scoop website, announces that GKids, which has licensed the American rights, has finished dubbing "Ernest & Celestine" into English and will release it theatrically on December 6, 2013. The English voice cast is listed. Cartoon Brew has now announced that Ernest and Celestine will be opening in New York and Los Angeles on March 14 next year, after which it will get a general US release.